Villa Mar Lanzarote is in a fantastic central location - you will be around 10 minutes' walk from the shops and restaurants of Puerto del Carmen . What's more the main Strip, with a huge number of shops, bars, restaurants and parallel beautiful sandy beach of Playa Grande, as well as the old town and harbour, are 15 minutes on foot. The villa has stylish interiors and mountain views from the first floor balcony. Air conditioning/heating in the bedrooms and lounge, pool heating and WiFi are included. 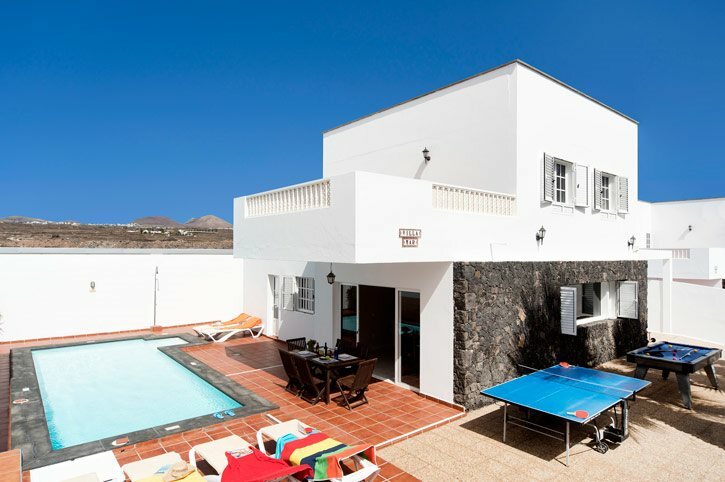 A delightful outside area, private swimming pool and central location in Puerto del Carmen - Villa Mar Lanzarote is a fantastic holiday choice! The outside area is surrounded by high walls ensuring a degree of privacy. The private swimming pool takes centre stage and has a sunbathing terrace to one side. This is a great place to soak up the Canarian sunshine. Next to it is a partially covered terrace housing an exterior dining set which, together with the brick BBQ, are ideal for alfresco dining. There is also a poolside shower and games tables for everyone to enjoy. A gate opens up onto the paved driveway which has plenty of space for your hire car. The open plan living area is illuminated by a large window over the lounge area and has a flat screen TV and ample seating. There is a patio door from the dining area to the pool. The whole room is decorated in light colours and has contemporary furnishings. Adjacent is a well-equipped kitchen with access to the utility room which houses the washing machine. On the ground floor there is a twin bedroom and a separate shower room. From the lounge the marble staircase takes you to first floor where you will find the double bedroom with an en suite bathroom, a twin bedroom and a separate bathroom. All bedrooms are tastefully decorated and have ample storage space. At the end of the first floor hallway is a door leading to the large balcony overlooking the pool with views of the volcanic mountains which are so iconic of Lanzarote. This is a great place to soak up the sun! Villa Mar Lanzarote is around 15 minutes' walk from the main Strip of Puerto del Carmen where you'll find a good number of shops, bars and restaurants. There are some bars and restaurants overlooking the sea. The sandy Playa Grande Beach runs parallel to the Strip with sun loungers and umbrella hire. If you're after some retail therapy, the Biosfera Shopping Centre and the delightful old town and harbour are also within walking distance. Villa Mar Lanzarote sits between our Villas Luz Lanzarote and Sol Lanzarote. There is a mini market around 330 yards away from the villa for your daily essentials with more choice in the resort centre. If you're after some retail therapy, the Biosfera Shopping Centre is just a little over 5 minutes' walk away and has several high street shops under one roof. You can also visit a local market in the old town and harbour area every Friday morning from 10:00. There is a choice of restaurants within 5 minutes' walk from the villa with a huge choice on the main Strip a little bit further away. In the old town and harbour area there is a vast array of bars and restaurants offering typical Canarian tapas, around 15 minutes' walk away. This is ideal for nightlife and dinner in one of the fish restaurants overlooking the boats in the harbour. The main beach of Playa Grande stretches for several miles and is fringed with tropical palm trees. For sun-worshippers there are sunbeds and parasols for hire, or for the more energetic, there are many sport activities to choose from. Alternatively, Playa Chica Beach, 15 minutes' walk away, has the unique underwater reefs and is very popular with divers. The Rancho Texas Park in Puerto del Carmen provides entertainment for all ages. During the day, there is an animal park with birds and animals from all over the world. At night, there's a cowboy and Indian theme night with entertainment, BBQ, disco, line dancing and games. The Timanfaya National Park is probably the most popular place in Lanzarote where you can see some spectacular volcanic scenery and ride camels. The harbour and old town of Puerto del Carmen both have maintained their charm and are still a popular meeting place for the locals. The play area in the square is surrounded by bars and restaurants with fabulous sea views from the wooden terraces. There is an 18-hole golf course 10 minutes' drive away, located behind Puerto del Carmen. A more established course is also available in Costa Teguise on the East Coast. Bike hire is a very popular activity in Puerto del Carmen and a great way to familiarise yourself with this resort. You can make the most of the purpose-built cycle lanes going along the coast and enjoy the beautiful scenery. Take a look here at the Lanzarote villas that are currently on sale. Villa Mar Lanzarote is not available to book for season as it is sold out. Take a look here at the Lanzarote villas that are currently on sale. There are many PADI dive centres, including several in both Puerto del Carmen and Playa Blanca, that cater for the first timer to the most experienced. From crystal clear shallow bays to night dives or shipwrecks the waters of the Atlantic offer an array of sea life waiting to be discovered. Manta Diving is located in Puerto del Carmen.Tel:928 516 815. Probably the most famous place in Lanzarote. Take the journey through the luna route passing some of the largest craters and the valley of tranquillity to fully appreciate the natural energy that has shaped the island. Here you can see demonstrations of the tremendous heat that still lies below the surface. On the way to Playa Blanca this tiny village is best known for the emerald green lagoon hidden between a black volcanic beach and the mountains. After the sight seeing go to the right and check out the pueblo. One of the best places to eat sea food and fish. Restaurants are right on the rocks with spectacular views of this black rugged coastline. First time we have booked with Villa Plus. We were very happy with the standard of the villa, and will certainly look at arranging another holiday with you again. Many thanks from the Morrison family. The service from Villa Plus was excellent from start to finish. I emailed with a few questions prior to flying out and always got a prompt, helpful response. We enjoyed a great holiday in a lovely villa and will definitely use Villa Plus again.